Giftsoc is pleased to host another wonderful game idea from Dr. Ronald G. Shapiro – Consultant and Speaker in Human Factors, Ergonomics, Learning, Leadership & Career Development. Children enjoy watching adults participate in games too! “Find the Present” is a version of “Hit the Pot” which is challenging for adults, but still easy for children to understand. It is also appropriate for groups of adults. I use it in my “Education by Entertainment” programs for pre-teenagers, teenagers and professionals. As in “Hit the Pot,” the contestant is blindfolded and needs to figure out what their present is and where it is hidden, but there is no pot, no spoon, and there are no “hot” and “cold” cues. Instead, the contestant is allowed to search for their present by walking around, and they may ask “Yes”/”No” questions. 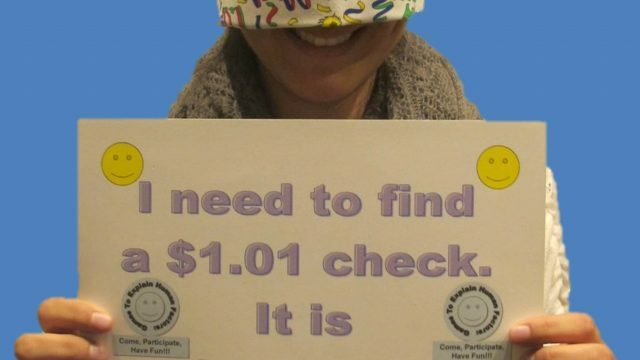 One suggestion for an unusual gift is to hide a check for an odd amount of money (say $1.01; or if the celebration is for an 18th birthday, $18.18!) 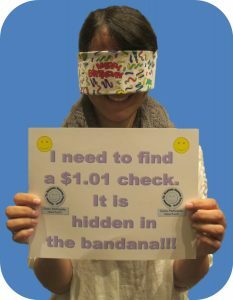 by folding it right into the aluminum foil lining of the bandana/blindfold! After a predetermined time, start to provide hints, so the contestant can eventually guess what their gift is and where it is located. Remember to take lots of photos and have fun! ©Ronald G. Shapiro, PhD. All rights reserved. For more family game ideas, visit Dr. Shapiro’s Birthday Suggestions website!